The revolutionary Intel 8008 microprocessor is 45 years old today (March 13, 2017), so I figured it's time for a blog post on reverse-engineering its internal circuits. One of the interesting things about old computers is how they implemented things in unexpected ways, and the 8008 is no exception. Compared to modern architectures, one unusual feature of the 8008 is it had an on-chip stack for subroutine calls, rather than storing the stack in RAM. And instead of using normal binary counters for the stack, the 8008 saved a few gates by using shift-register counters that generated pseudo-random values. In this article, I reverse-engineer these circuits from die photos and explain how they work. The image below shows the 8008's tiny silicon die, highly magnified. Around the outside of the die, you can see the 18 wires connecting the die to the chip's external pins. The 8008's circuitry is built from about 3500 tiny transistors (yellow) connected by a metal wiring layer (white). This article will focus on the stack circuits on the right side of the chip and how they interact with the data bus (blue). The die of the Intel 8008 microprocessor, showing the stack and other important subcomponents. You might think that an intelligent terminal is a curiously specific application for the 8008 processor. There's an interesting story behind that, going back to the roots of the chip: the Datapoint 2200 "programmable terminal", introduced in June 1970. The popular Datapoint 2200 was essentially a desktop minicomputer with its processor consisting of a board full of simple TTL chips. The photo below shows the CPU board from the Datapoint 2200. The chips are gates, flip flops, decoders, and so forth, combined to build a processor, since microprocessors didn't exist at the time. The processor board from the Datapoint 2200. The 8008 microprocessor was created to replace this board, but was never used by Datapoint. Photo courtesy of unknown source. To keep track of the top of the stack, the Datapoint 2200 used a 4-bit up/down counter chip to hold the stack pointer. The clever thing about this design is there's no separate program counter (PC) and stack; the PC is simply the value at the top of the stack. You don't need to explicitly push and pop the PC onto the stack; for a subroutine call you just update the counter and write the subroutine address to the stack. 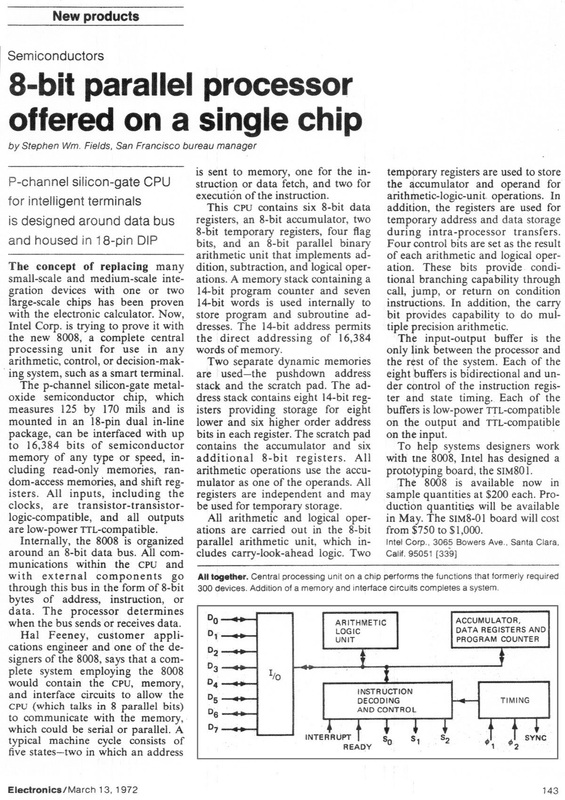 The story of the 8008's origin is that Datapoint went to Intel and asked if Intel could build a chip that combined the stack memory and the stack pointer onto a single chip. Intel said not only could they do that, they could put the whole processor board onto a single chip! This was the start of Intel's 8008 project to duplicate the Datapoint 2200's processor board onto a chip, keeping the Datapoint 2200 instruction set and architecture.6 After various delays, Intel completed the 8008 microprocessor, but Datapoint rejected it. Intel decided to sell the 8008 as a general-purpose processor chip, sparking the microprocessor revolution. Intel improved the 8008 with the 8080 and then the 16-bit 8086, leading to the x86 architecture that dominates desktop and server computers today. The consequence of the 8008's history is that it inherited its architecture and instruction set from the Datapoint 2200 intelligent terminal. One of these features was the fixed, internal stack. But the 8008's implementation of that stack is unusual. The most unexpected part of the 8008's stack is how it keeps track of the current position. The straightforward way to implement the stack would be with a binary up/down counter to keep track of the current stack position (which is what the Datapoint 2200 did). But to save a few transistors, the 8008 uses a nonlinear feedback shift register instead of a counter. The result is the stack entries are accessed in a pseudo-random order! But since they are read and written in the same order, everything works out fine. The shift register outputs are based on a de Bruijn sequence, a cyclic sequence in which every possible output occurs as a subsequence exactly once. The 8008's de Bruijn sequence is shown below. The first value (000) is underlined in red. Shifting to the blue position yields the second value (001). 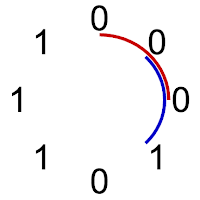 Proceeding around the circle clockwise yields all eight values in the sequence: 000, 001, 010, 101, 011, 111, 110, 100 and finally back to 000. Note that each value appears exactly once, but they are not in standard binary order. This de Bruijn sequence contains all eight 3-bit values as subsequences. 000 and 001 are underlined. The Intel 8008's internal counters are built form this sequence. The diagram below shows how the 8008 implements the nonlinear feedback shift register counter. While it make look complex, it's a straightforward implementation of the de Bruijn sequence. 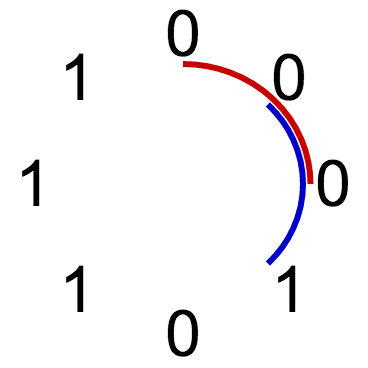 The three latches in the middle form a shift register, with each latch holding one bit. To count up, each bit is shifted to the left and a new bit is added on the right (green arrows). To count down, each bit is shifted to the right and a new bit is added on the left (purple arrows). The logic gate on the left generate the "new" bit for counting down and the gates on the right generate the new bit for counting up. The 8008 uses the above circuit for its internal stack counter. The refresh counter is based on this, but counts up only. The logic gates may appear complex. However, one feature of PMOS logic is it's as simple to build an AND-OR-NOR gate as a plain NOR gate, just by wiring transistors in parallel or series. Designing the logic is also straightforward: for each triple of current bits, the de Bruijn sequence specifies the next bit. If you've studied digital logic, Karnaugh maps can be used to create the logic circuits to generate the desired next bit. The 8008 uses dynamic RAM (DRAM) to for its stack storage and its registers. The other 1970s microprocessors that I've examined use static latches, so the 8008 is a bit unusual in this regard. Since Intel was primarily a RAM company at the time, I assume they wanted to leverage their RAM skills and save transistors by using DRAM. Each bit of storage in the 8008 uses a cell with three transistors and one capacitors, called a 3T1C cell, similar to the cell in Intel's i1103 DRAM chip. The diagram below shows a closeup of the 8008's stack storage, with six DRAM cells visible. Each row is one 14-bit address in the stack. Each row has a read enable and write enable control line coming from the left. Each column stores one of the 14 bits; the column sense line is used to read and write the selected bit. 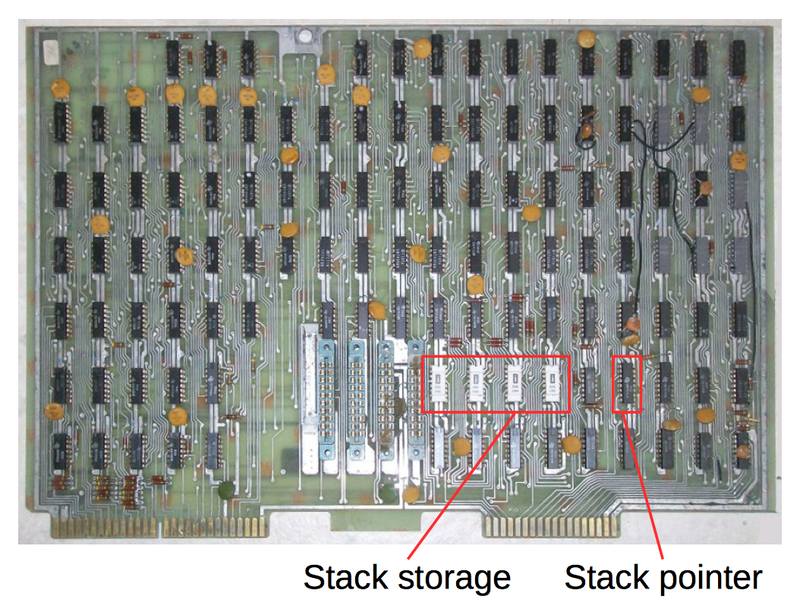 Detail of the Intel 8008 microprocessor's die, showing six storage cells for the stack registers. Each bit is stored with a DRAM cell consisting of three transistors and a capacitor. To write a bit, the write line for the desired row is pulled low, turning on T1. The desired voltage (low or high) is fed onto the sense line, passes through T1, and is stored by the capacitor. To read the value, the appropriate read line is pulled low, turning on T3. If C has a low voltage, T2 is turned on. This connects the sense line to ground through T3 and T2. On the other hand, if C has a high voltage, T2 is turned off and the sense line is not grounded. Thus, the circuitry connected to the sense line can tell what bit value is stored on C.
I'll briefly explain what you're looking at in the die photo above. The chip itself is made from a silicon wafer. Plain silicon is essentially an insulator, but by doping it with impurities, it becomes a semiconductor. The dark lines indicate the boundary between doped and undoped regions; the doped silicon in the first cell is indicated in red. On top of the silicon is the polysilicon layer, which is the yellowish stripes. Polysilicon acts as a conductor and is used as internal wiring of the chip. More importantly, a transistor is created when polysilicon crosses doped silicon. A thin oxide layer separates the polysilicon from the silicon, forming the transistor's gate. A low voltage on the polysilicon gate causes the transistor to conduct, connecting the two sides (called source and drain) of the transistor. A high voltage on the gate turns the transistor off, disconnecting the two sides. Thus, the transistor acts as a switch, controlled by the gate. The top layer of the chip is the metal layer, which is also used as wiring. For the photo above, I removed the metal layer with hydrochloric acid to make the underlying silicon more visible. The green, blue and gray lines indicate where the metal wiring was before being removed. Transistors T1 and T3 are connected to the sense line (blue), while transistor T2 is connected to ground (green). The read and write lines enter the circuit on the left as metal wiring, connected to polysilicon lines. To access memory, the address in the stack must be provided to external memory via the 8 data/address pins on the chip. These pins are connected to the stack (and other parts of the 8008) via the data bus. The die photo below shows the circuitry that interfaces the 14-bit stack storage to the 8-bit data bus.11 At the top of the photo are the metal control lines and three of the data bus lines. At the bottom are the sense lines, discussed earlier, from the stack storage. In between are the transistors (orange) that connect the data bus and the stack. The control lines select the low (L) or high (H) half of the address. These activate the appropriate read or write transistors, connecting the appropriate stack columns to the data bus. The stack /bus driver circuit provides the "glue" between the data bus and the stack DRAM storage. 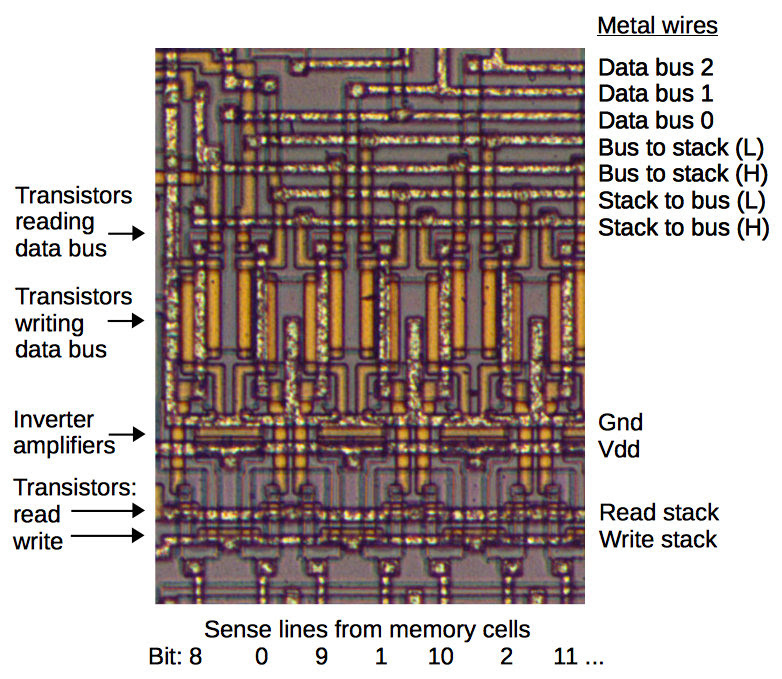 The transistors to write an address to the data bus are much larger than typical transistors, appearing as vertical yellow bars in the die photo. The reason for this is the data bus passes through the whole chip. Due to the length of the bus, it has relatively high capacitance and larger, high-current transistors are required to drive a signal on the data bus. 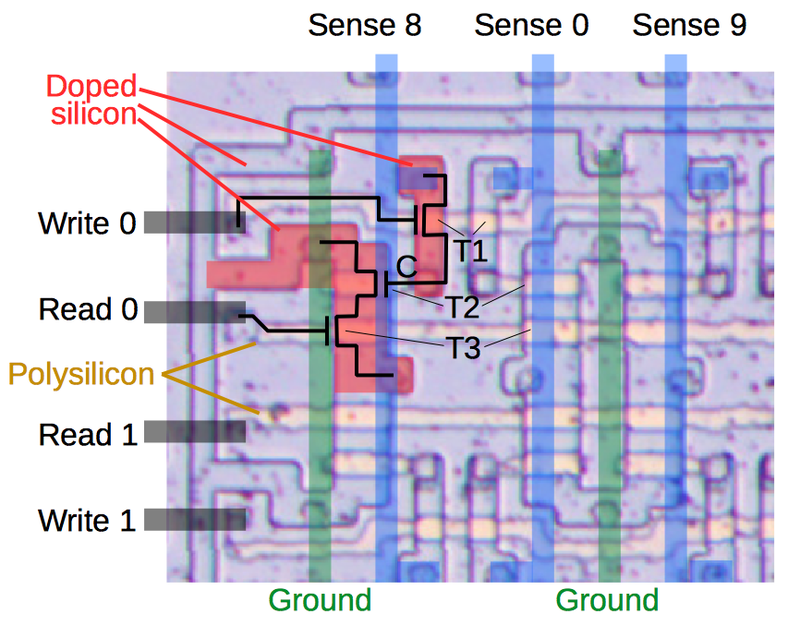 By examining die photos, it is possible to reverse-engineer the 8008 microprocessor. One unusual feature of the 8008 is that instead of using standard binary counters internally, it saves a few gates by using shift-register counters. Although these count in a pseudo-random order rather than sequentially, the 8008 still functions correctly. One counter is used for the on-chip address stack. The 8008 also uses DRAM internally for stack storage and register storage, requiring a second counter to refresh the DRAM. Since every transistor was precious at the dawn of the microprocessor age, the 8008 has these interesting design decisions that produced compact circuitry. If you're interested in the 8008, my previous article has a detailed discussion of the architecture, more die photos and information on how to take them. 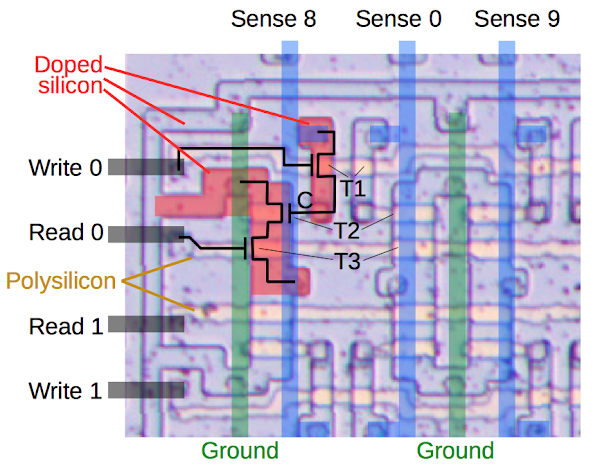 This article explains the 8008's ALU. 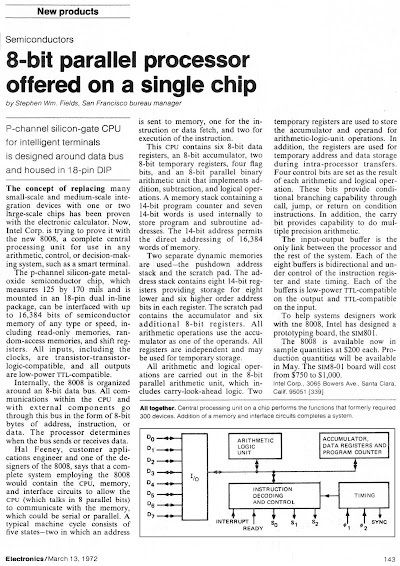 The 8008 chip was announced in Electronics on March 13, 1972: "8-bit parallel processor offered on a single chip." The i3101 memory was called the 3101 due to Intel's part numbering system at the time, described in Intel Technology Journal, Q1 2001. To summarize, the first digit indicate the product family: 1xxx is PMOS, 2xxx is NMOS, 3xxx is bipolar and so forth. The second digit indicates the product type: 1 is RAM, 2 is a controller, 3 is ROM, and so forth. The last two digits are sequence numbers typically starting with 01. Thus, the first bipolar RAM was the 3101. Nonlinear feedback shift registers seem pretty obscure. The only other use I've seen is the TMS 0100 calculator chip, which generates an internal sequence of length 11. For information on the theory, see The Synthesis of Nonlinear Feedback Shift Registers and Counting with Nonlinear Binary Feedback Shift Registers. The book Shift Register Sequences goes into great detail on linear and nonlinear sequences; Section VII:5 is probably most relevant, describing how to make a shift register cycle of any length. Regarding note 8, a famous use of Linear Feedback Shift Register counters was in the TIA (Television Interface Adaptor) of the Atari 2600 videogame console. Any idea why Datapoint rejected both TI and intel designs ? Did they use a third entrant ? Adrian: I've heard a variety of reasons why Datapoint rejected the TI and Intel microprocessors: they couldn't get the chips to work reliably, they had a new switching power supply that eliminated the cooling issues from TTL, the chips came too late, etc. In any case, Datapoint redesigned their circuit board to use the 74181 ALU chip, which was much faster than the microprocessors. It took several years before microprocessors were faster than TTL. Another semi-well-known chip using a shift register as the program counter: the CIC copy protection chip used on the NES: https://hackmii.com/2010/01/the-weird-and-wonderful-cic/. It is apparently based on some 4-bit Sharp mask ROM microcontroller.